In September 2015, the 50th accelerator module for the X-ray free-electron laser European XFEL was tested at DESY. One hundred accelerator modules are needed for the two-kilometre-long electron accelerator of the X-ray free-electron laser. Each module consists of eight cavities, the actual accelerating structures. This is the first of a three-part series (first published in DESY inForm) about how these technological masterpieces are manufactured. Part 1 is about cavities; their production has now been completed. Two companies have been commissioned with the cavity production: Research Instruments (RI) in Germany and Zanon in Italy. “This is the first time we have ordered cavities virtually ready for operation from industry,” emphasises Axel Matheisen who together with Waldemar Singer leads a team of engineers and technicians at DESY supervising these firms. In the past, industry had only carried out the mechanical production steps. “For that reason, our greatest concern was whether we would manage to convey the necessary knowledge in a way that the companies are able to produce complete cavities,” says Mattheisen. The tested cavities prove that this knowledge transfer worked perfectly. At the beginning of the long production process, there is a square niobium sheet with an edge length of 26.5 centimetres and a thickness of 2.8 millimetres. For the construction of the accelerator, the purity of 14 700 sheets is tested at DESY before being dispatched to the two production firms. There, the sheets are deep-drawn to so-called half cells which gives them the appropriate shape for further processing. A stamp is used to obtain the required hollow pattern … the cavity. Subsequently, 18 half cells are welded together to form one cavity. Since niobium oxidises very easily, this cannot be done with a flame. 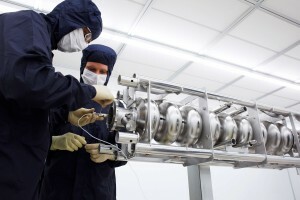 Instead, the half cells are welded together with an electron beam in a vacuum chamber. The advantage: this procedure is very clean. For this reason, the nine-cell cavity must be protected from new contamination during further processing. For accelerator operation, the quality of the cavity’s inner surface is extremely important. It must not only be hyper clean but also exceptionally smooth. “In the past, the cavities were delivered to us and we did the rest. This went quite well with ten or occasionally with 30 cavities per year. But it was clear that this would not be possible with some 100 cavities per year,” Mattheisen says. For the construction of the European XFEL, the firms had to learn to carry out the surface treatment according to the “DESY recipe” and to work in a nearly dust-free cleanroom. “This was completely new for them and therefore, communication was ex- tremely important,” Mattheisen points out. The most important steps in this process are pickling, baking, tuning, dressing and rinsing. For pickling, various different acid mixtures are lled into the cavity. The acid reacts with the metal surface of the cavity and removes processing residues and polishes the surface. The acids’ mixture ratio and the extent of the pickling procedure have been optimised during many years of research at DESY. Baking follows pickling: the cavity is heated at 800 degrees centigrade for several hours in a humidity-free vacuum environment. During this treatment, tensions in the metal originating from shaping and welding are released and the ne crystal structures of niobium are newly arranged. After getting out of the oven, the cavity is tuned. In order to accelerate particles during operation, electromagnetic fields are induced to oscillate in the cavity and, eventually, the oscillation will turn into resonance. For this aim, however, the shape of each cavity cell must be exactly tuned to the accelerator frequency of 1.3 gigahertz. In the process of tuning, the resonance frequency is measured and when it diverges from the desired frequency, the cavity must be retuned. For this purpose, the cavity shells are pressed and pushed accordingly. Slight shape alterations can signi cantly improve the resonance. The production is completed with rinsing: the inner surface of the cavity is sprayed off for some hours with high pressure ultrapure water of 100 bar. Now, the cavity with a vacuum inside leaves the cleanroom. Packed in a special case, it is shipped to DESY by lorry. However, the cavity is not yet ready for installation into a European XFEL module. It will first have to demonstrate its qualities. I have read the process with great interest. I want to make this process into CG animation some day! I am sure it would be a spectacular animation!